The Last Supper is a new sculptural installation by Ken + Julia Yonetani, whose diverse practice encompasses sculpture and installation, video and performance. Environmental issues are central to their works which often use materials such as sugar, salt, and Uranium glass that directly relate to specific environmental concerns. 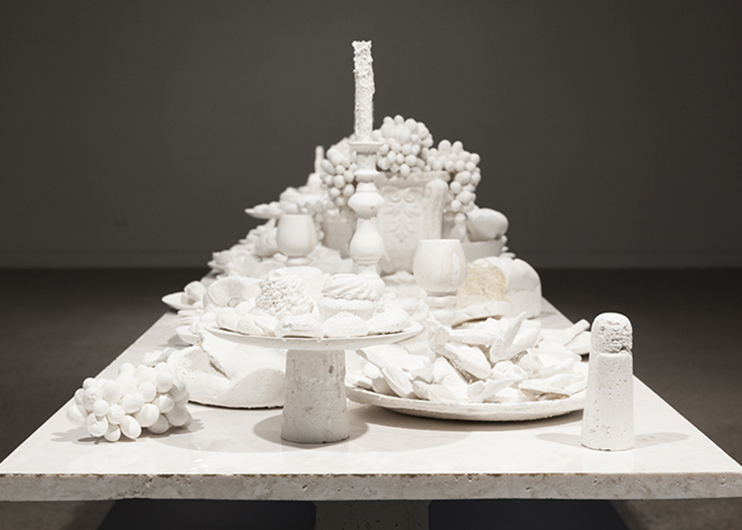 Created during a four month residency at Hazelhurst Regional Gallery & Arts Centre in Gymea, New South Wales, The Last Supper is a nine metre long banquet table sculpted entirely from more than one tonne of Murray River salt. The work points to concerns arising from increasing salinity levels in Australia and unsustainable agricultural practices. Image: Ken + Julia Yonetani, The Last Supper (detail) 2014. Commissioned by Hazelhurst Regional Gallery & Arts Centre. Photography by Silversalt. Courtesy of the artists and Hazelhurst Regional Gallery & Arts Centre.